They said that there was not very good antenna reception here in Monroe, Washington, but I hooked up a couple antennas and now we have free TV. When we first got rid of cable a few years back, I got an inexpensive antenna that looked like it came out of the fifties. I tested it in the living room and we just got one channel. Even so, I was not deterred. 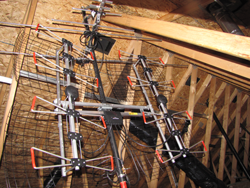 I hooked it up in the attic figuring the added height would give us more channels. I did not want to put it on the roof because I did not want the large monstrosity poised on the roof like the skeleton of a hang glider. Nor did I want to put bolts into the roof and get possible leaking. Besides, my parents used to have an attic antenna hooked up and they live as far away from all the towers in Spokane as we do from the ones in Seattle. I figured if an attic mounted antenna was good enough for my dad all those years ago, it ought to be good enough for me now. After mounting the antenna in the attic and hooking up the cables, I was all set. I was excited as the TV tried to tune into the digital signals being broadcast by stations far away in Seattle. Nothing. 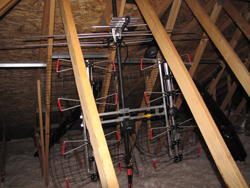 I spent what seemed like hours in the attic repositioning the antenna to try to get as many stations as possible. I even turned the antenna more to the north of us to try and get signals from a different town a bit closer. Still nothing. I went back to TVFool.com, put in our address, and got the map of stations near us and what we might expect to see. The website said the same thing the guy at Radio Shack said. There is not much reception here in Monroe. But I was determined. After all, we had already cut our ties to cable TV. But Netflix did not have news, which was what my wife wanted. And there was not much streaming news on either our AppleTV or Roku. Which was why I put the antenna in the attic in the first place (after a few months of no live TV). I finally found a spot where we got stations. Okay. One station. FOX. My wife was not excited, but I was satisfied. We had real TV and no cable bill with an inexpensive one-time purchase. Plus, there was not an antenna on the roof. No gargoyle to leer down at me. And as an added bonus, we could actually watch a few Seahawks football games. After about a year of just one station, I was the one who wanted to get a few more channels. I am not a huge sports fan, but I do like to watch a college or pro football game from time to time. Plus with fantasy football, I wanted to see those statistics on the bottom of the screen almost as much as I wanted to see my mom’s beloved Seahawks play each week (she is a huge fan). So I got another antenna. Not to replace what we had, but to enhance what we were getting. Well, this new antenna was pretty fancy. I had researched quite a bit and found the one that could get the best signals from miles away. And one that would work in the attic. There were good and bad reviews, but I found that they were all helpful. So I got the antenna. The Antennas Direct DB8E. I ordered it from Amazon and got it in a couple days. I spent quite a while in the attic getting it all set up. I got a longer pipe for mounting both antennas, one above the other. I went to Radio Shack and got a coaxial connector to combine the signals from the two different antennas. (I did not think about what the guy said about not getting over the air signals in Monroe.) I got another coaxial cable, but forgot that I needed even one more. Thankfully, I had one at home. I got it all hooked up and pointed in what I thought was the right direction. We turned on the autotuning to search for channels. Nothing. Not even FOX. We had lost the channel that was so steady. Well, I went back up to the attic and fiddled around. I pointed the antennas different directions. I configured them different ways. We even Skyped from the attic to downstairs to see if moving the antenna a little one way or another got more channels. In the end we finally got seven channels, including three major networks, ABC, NBC, and FOX. These had secondary (and one had a tertiary) stations too so we ended up with those seven stations. We got more news. And more importantly, we got another station on which to watch Mom’s beloved Seahawks. Just in time. But the story is not quite over. The weather has much to do with over-the-air signals. On a clear day, we ended up getting five more channels. Without fiddling with the antennas. Sure, two of them are broadcast in Spanish, but we now have twelve over-the-air TV stations. In an area where the experts said we would likely not be able to get any. It has been a long time since I was enamored with TV. Maybe since we got the color TV to replace the old black and white way back when I was a kid. Still, I am happy that we have a few stations with not much on them. And it beats paying for lots of stations with not much on them. I know I should not do it, but I am probably going to head back up to the attic again. After all, I found out that Mom’s beloved Seahawks are playing on the last major station that we do not have. Maybe I am tempting fate going up there again to adjust the antennas, but it does not really matter. After all, we do not get very good TV reception here in Monroe. But I still have free TV.